Back in 2008, when the marketing machine for the apocalyptic flop, “2012” was in full swing, people were seriously considering the Mayan calendar to be more trustworthy than a Farmer’s Almanac. Folk circled December 12, 2012 on their calendars as “The End” and planned their early Christmas shopping accordingly. We spray painted story-after-story on the Wall about it too because of the near-phobic concern some dunderheads began festering in a deified puppy-iguana-really ugly dude named Quetzalcoatl. His “Age of Transition” was nigh upon us, only three years early. As we know, we are still alive, the Mayans are still yet holding on for three more years and that movie blew. Much. There will no movie rights for this tool. And now I understand why… because the world was never meant to end in 2012. It’s 2011, according to this lovely biblical scholar quoted in the San Francisco Chronicle. [Harold] Camping, 88, has scrutinized the Bible for almost 70 years and says he has developed a mathematical system to interpret prophecies hidden within the Good Book. 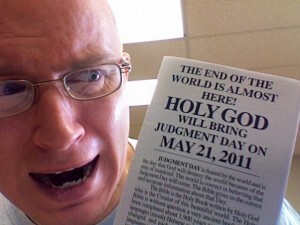 One night a few years ago, Camping, a civil engineer by trade, crunched the numbers and was stunned at what he’d found: The world will end May 21, 2011. Dude, the Bible isn’t the IRS tax code. You can’t take your tattered KJV66 to H&R Block and stress the need for a rapid refund. But of that [exact] day and hour no one knows, not even the angels of heaven, nor the Son, but only the Father (Matthew 24:36 AMP). Yeah, because Jesus just couldn’t his plan for global destruction through to this guy in algebraic equations on a wet nap. and won’t soon be returning! The false prophet is a religious organization that is why he is called a false prophet. He is not of God but of the devil. The false prophet is also not a man like the antichrist as the Bible says. The false prophet leads the world astray and guides them back to romanism and away from the truth. This religious body show the entire world by television how they are able to heal the sick and speak in tongues and such. We can only find the false prophet protestantism doing this today through people like benny hinn and others. so when this comes to pass in the new world order than you might believe. I really don’t understand how you recover from getting that so wrong. Okay, fine, so people were dumb enough to listen to him once before … but the second time? Really? Did their moms not teach them the old “Fool me once, shame on you; fool me twice, shame on me” thing?